APEC, the Asia Pacific Economic Co-operation, have been incompetent and ineffective dealing with climate change. The APEC climate agenda is not one that will ever or can ever lead to an environmentally sustainable or just world. Their policy mandate is to promote the neo-liberal market agenda. Howard has placed climate change on the APEC agenda and is making it one of the meeting's main focuses. He argues that APEC provides a “special opportunity” to address climate change issues because it brings three of the worlds major GHG emitters – United States, China and Russia to the same table. The APEC region accounts for 60 per cent of the world's energy demand, and across the group demand is expected to double by 2030. Internationally though, it has been APEC nations who have been hindering progress on international progress towards action on climate change and who have been actively sabotaging international attempts to reach binding agreements. For example, the United States, is the worst polluting nation; their government has been dragging their feet for years and refusing to ratify the Kyoto protocol. At the recent Vienna Climate change meeting, it was APEC members Canada, Japan, New Zealand, Australia, South Korea who were most hindering progress. There is every reason to be skeptical of the intentions of these leaders; in fact the 'significant' climate debate that Howard and Bush are pushing is really smokescreen to real change. It is clear that the difficult decisions on climate change are facing all the APEC member countries. However, we approach APEC with a confrontational attitude, since we do not think that lobbying can have a major impact in such biased and undemocratic organisations, in which transnational capital is the only real policy-maker. APEC has an Energy Working Group that meets twice a year. The Energy Working Group rejects the UN Multilateral Kyoto Protocol climate change strategy, and advocates ‘clean coal’ and nuclear energy as solutions to global warming. Australia and the US are strong supporters of these solutions. This focus in the APEC Energy Working Group is unsurprising, given its strong links to the business community and the private sector and its implicit mandate for protecting their interests. It is advised by an Energy Business Network that receives substantial input from companies such as Rio Tinto, BHP Billiton and US Chevron Oil Company, but no corresponding input from environment or community groups. In short, APEC policy is driven by all the corporations whose vested interests lay in the continual burning of fossil fuels. Howard sees APEC as an opportunity for developing what he calls “a truly international framework for realistically tackling climate change”. Problem is we already have one – the Kyoto Protocol. Whilst it is clear that the Kyoto Protocol is manifestly inadequate to deal with the massive threat posed by climate change, its targets of 5% reductions go nowhere near that immediate dramatic cuts in CO2 emissions that the sceintific community agree is necessary to avoid dangerous climate change effects. However, Howard's plan (and the APEC agenda) is clearly aimed at weakening Kyoto further and to completely by-pass Kyoto with an even more ineffectual agreement. In his speech to the Lowy Institute Howard argued that “APEC can build consensus on a way forward that avoids the pitfalls of the Kyoto model.” When Howard points to the pitfalls of Kyoto he is arguing not against its limited targets or its highly contentious market based mechanisms but against the limited principles of equity in the Protocol. Malaysia's Trade Minister Rafidah Aziz replied to this: "It is unfortunate that people who are talking about climate change like America [read: and Australia] are not even members of the Kyoto Protocol ... If you want to talk about climate change, please join in with the rest of the global community to make commitments about managing climate change,"
Rather than commit to real targets that are urgently necessary to avoid dangerous climate change, APEC is seeking aspirational rather than binding targets. Howard has stated that he want APEC leaders to agree for the first time that a international agreement should include long-term “aspirational goal” for cutting emissions. Countries will simply do what they can, on their own time-lines. It is not good enough for affluent countries to simply “aim” to cut their emissions, rather then actually take the steps necessary. Europe has committed to 20% cuts by 2020, and the recent U.N. climate conference in Vienna concluded that industrialized countries should now strive to cut emissions by 25 percent to 40 percent of their 1990 levels by 2020, in line with recommendations of the latest IPCC reports. It was also proposed that the target would serve as a loose guide for a major international climate summit to be held in December in Bali, Indonesia. APEC is aiming to promote nuclear power as a solution to climate change. Nuclear energy is no solution to climate change. Huge amounts of energy are needed to mine and enrich uranium, build and decommission nuclear reactors, and transport and store radioactive waste. There is still no safe way to dispose of nuclear waste. The huge costs needed to subsidise nuclear power would be better spent on safe renewable energy, such as solar or wind. Discussions at APEC will pave the way for Australia and Russia signing a Nuclear Cooperation Agreement which will update our bilateral safeguards arrangements to facilitate the export of uranium.Discussions will also be happening with Bush about bilateral action plan for civil nuclear energy cooperation, including on research and development, regulatory issues and skills and technical training. At the recent APEC Energy Ministers Meeting in Darwin, nuclear energy solutions continued to receive broad support, while the wind and solar industries were not even represented. We need real action on climate change. Climate change must be dealt with by real changes to our economy and society, not by substituting one environmental disaster for another. APEC policies assume that climate change can be dealt with through market mechanisms and on a “business as usual scenario.” In his speech to the Lowy Institute Howard argued that any way forward on climate change “should take account of the reality of continued use of fossil fuels... and the proven contribution that can be made by nuclear power.” The harsh reality is that the continued burning of fossil fuels at current rates simply cannot be part of an ecologically sustainable or just future. The other mechanisms supported by APEC such as improving forestry and land use management, sequestering substantial quantities of carbon dioxide from the atmosphere are similarly no real solutions to the problem. APEC also argues that “economic growth and prosperity is the best means of tackling the very environmental issues that rich industrialized countries are also tackling.” In fact, climate change cannot be tackled via economic growth and market mechanisms. Climate change and the current crisis we are facing is a direct result of an economic system that priorities growth and profit over human need. APEC simply needs to get out of the way. We can't accept any more stalling from neo-liberal governments and corporations as we suffer debilitating droughts, the seas rise and countless species go extinct. 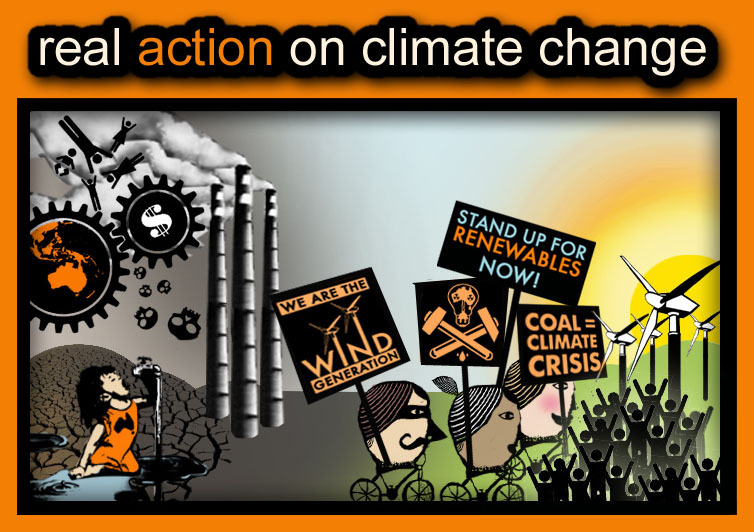 Real solutions to climate change require a very clear rejection of capitalism, imperialism and feudalism; all trade agreements, institutions and governments that promote destructive globalisation.